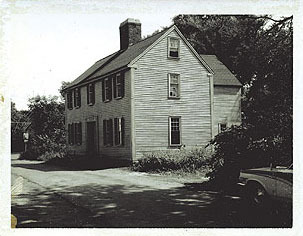 This exhibition tells the history of the re-created, 2 1/2-story, Georgian-style house that stood at 16 Elm Street in Ipswich, Massachusetts, and five of the many families who occupied it from the mid-1760s through 1945. The exhibition explores some of the important ways ordinary people, in their daily lives, have been part of the great changes and events in American history. Walking around the exterior of the house, visitors can view—through open walls, windows, and doorways—settings played out against the backdrop of Colonial America, the American Revolution, the abolitionist movement, the industrial era, and World War II. Near the exit is a list of all the families who lived in the house through the 1960s.